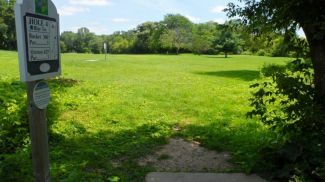 Description: On the former Hillmoor Ball Golf Course, this course winds its way through pristinely a manicured setting with rolling hills, strategic stands of trees, surrounding woods, a pond, and the White River bisecting the property. Elevation is used to compliment the beauty and add challenge as well as fun. Blue tees play par 56 and SSA is estimated to be around 49-50. Red tees take away much of that distance and challenge associated with river or pond crossings, but still yield a great fun round for recreational players. Red tees will offer the perfect round for beginners looking to try out this new city park activity. Ace runs, river crossings, some dense woods, risky greens, OB paths, and more await you here at this new gem. Alternate pins add another 600' total length. They are placed nearer the river, tucked into dense woods, on small ridges, and along OB pathways. Look for terraced greens and elevated pads in the future. More strategic tree planting areas soon to come as well! Local Directions: From Main street turn north onto Mill Street and follow one block to the intersection of Mill, Sage, and Geneva Streets. Off the parking lot on the left is where you will find the Blue tee for Hole 1 on top of the hill. You can also park a bit to the north off Sage street in the school parking lot near the skate park.